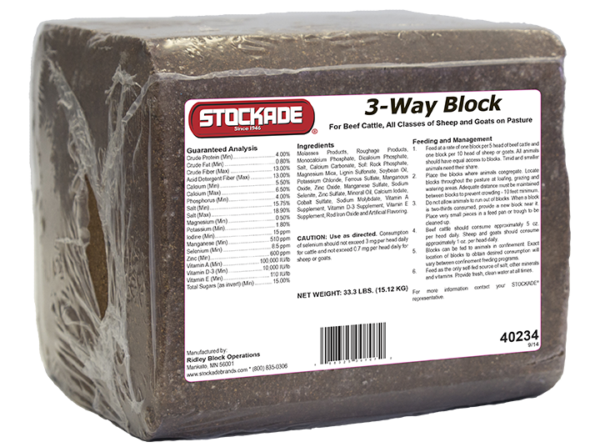 Multi-purpose mineral & vitamin block for cattle & horses. Multi-purpose mineral and vitamin block for cattle and horses. 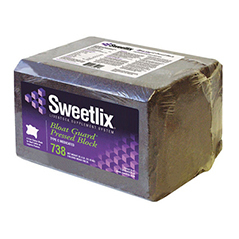 Superior to trace mineral salt blocks. Palatable source of high quality minerals and vitamins. Available in easy to handle 40lb. pressed blocks. Weather resistant block can be placed directly in pastures with horses and cattle. Usage: Feed 1 block per five head of cattle or horses. This allows all animals equal access to blocks. Cattle and horses will consume about 5 oz. per head per day. Feed as the only FREE CHOICE source of salt, other minerals and vitamins. Analysis: Calcium: 5% Phosphorous: 4% Salt: 15-18% Vitamin A (Min): 100,000 IU/lb. Vitamin D-3 (Min): 25,000 IU/lb. Vitamin E: (Min): 100 IU/lb.